Experts have warned that the playground classic, the conker, could be wiped out in just 15 years. The population of the horse chestnut tree is under threat due to an invasion of an exotic pest combined with the spread of a killer disease. The horse chestnut leaf miner originally observed in Greece has spread throughout central and Eastern Europe during the late 1980’s and was first observed in the UK in 2002 in Wimbledon, London. Since then, leaf miner in horse chestnut trees has spread throughout the majority of England and Wales and was first observed in Scotland in 2015. Horse chestnut leaf miner is caused by a small moth whose larvae feed inside the leaves resulting in brown or white blotch mines to develop between the leaf veins which destroys most of the leaf tissue. This can impact on the typical autumnal falling of the leaves, with horse chestnut leaves defoliating before this seasonal event. Research has suggested that by as early as August, a substantial proportion of the leaf surface will be inhabited by leaf miner, giving the impression that the tree is dying. Investigation into leaf miner how shown that generally, when new horse chestnut trees are planted, they don’t survive past 5 years old as leaf miner defoliate the leaves so that they can no longer produce enough for new trees to grow. 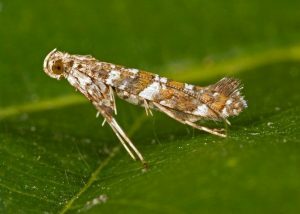 Although the leaf miner moth causes significant damage to the leaves on an annual basis, on it’s own, the pest doesn’t normally cause damage to older horse chestnut trees’ health as they usually bloom again the following spring. Mature trees are strong enough to withstand the effects of leaf miner, but are deteriorating from a disease called the bleeding canker and even impact on the reduction in the size of conkers. It is believed that leaf miner combined with bleeding canker will leave horse chestnut trees susceptible to die-back. 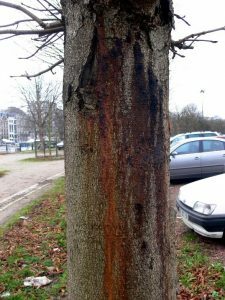 Bleeding canker is a disease that particularly infects the bark of horse chestnut trees caused by the pathogen Pseudomonas syringae pv. Aesculi. As a result, dark red/brown sticky liquid bleeds from cracks in the bark. The effect on the tree is variable in most cases, with some infections lasting for years with little damage. Others spread rapidly causing the crown of the tree the thin and die-back. The incidences of the disease in the UK has risen dramatically in recent years which is thought to be due to warmer winters and wetter summers. 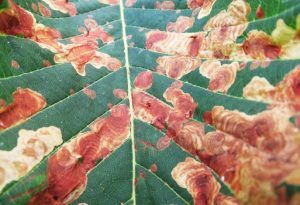 Bleeding Canker combined with leaf miner is having a devastating effect on the population of horse chestnut trees nationally. Once in a location, most of the trees in that area will suffer and die within a couple of years. Council health and safety officers are implementing the removal of horse chestnut trees for fear that damaged branches will fall and injure passers-by. Damage can be reduced by removing fallen leaves and composting them thoroughly. Cover piles of damaged leaves with soil or other plant material to prevent adult emergence of moths the following spring. Purchase a horse chestnut miner trap which uses pheromones to attract and catch adult moths to reduce the mating of the moth to help in the decline of the infestation. Some infections do stabilise, so it is important to note that immediate removal is not required in all circumstances, but keep close observations on affected trees. If the condition continues to decline, remove any major branches that are infected. Dead branches may suddenly break off as the wood dries out. Where lesions are extensive the entire trunk may have to be girdled, however, this will cause the tree to die and will need to be subsequently removed. Disinfect tools after use to prevent contaminating other trees.